“Shasta” is everything I had hoped for from this cross and more! This filly is correct, pretty and has an happy go lucky, with a lets check it ALL out attitude - my character of the foal crop so far! Bay with chrome - definite Sabino and 99% sure she's splash, it looks like her left eye has a curve of blue along the bottom, but whether she is splash, or not - she's staying! I named her Shasta Lily (also known as the Mt.Hood Lily) as this is a native lily of Oregon that grows not far from where Intrigue lives and it is a bright while lily, super showy - a real standout, just like this filly! 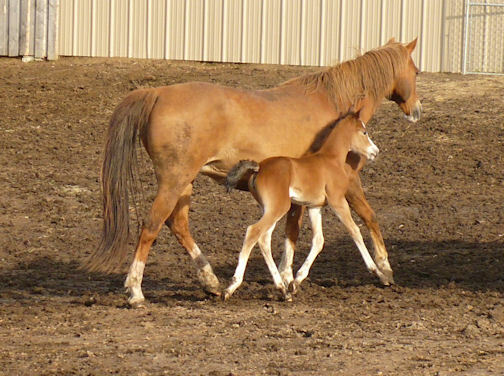 Our weather has been really ugly and the mares/foals were in the barn for a few days. I apologize for the mud on mom - the first thing she did when she got outside was have a good roll! May 31, 2010 after out big (very late) snowstorm! May 29, 2010 - approx 3 days old here, stuck inside due to late storm.